This Manfrotto 0836 Salon 230 Camera Stand is part of the Manfrotto family of camera stands. Manfrotto camera stands offer support for every camera size, and generally vary by versatility of their movements. They're equipped with retractable wheels for easier placement around the studio. The column, which travels nearly 65" (165 cm), has pneumatic dampening and a 3/8"-16 threaded screw protruding from the top. Ideal for passport, ID cameras and other general studio applications ranging up to 8x10 and beyond. 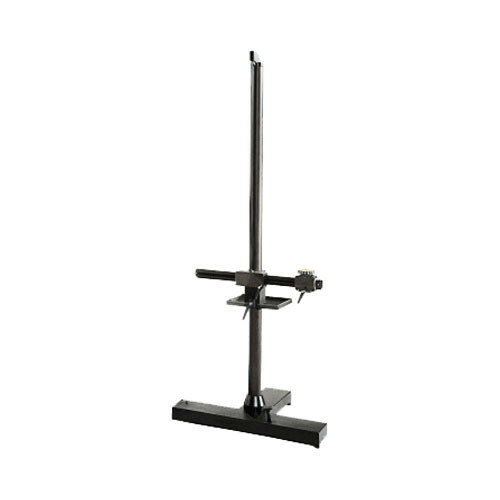 Salon 230 Camera Stand - 7' is rated 4.5 out of 5 by 2. Rated 4 out of 5 by Anonymous from Very sturdy and well made We needed a stable support (for a heavy piece of gear) that has minimal intrusion into the space in front of the gear. This stand provides for movement, although not easily directed when loaded, a necessity. Additional weights can be added to help support heavier gear. The arm with camera support provides one axis of tilt (up/down), and a second axis (side/side rotation) would have been welcome. A separate head is required for convenience. We ended up making a lot of added-on stuff to get the positioning versatility we required. This stand provided a good start with stable attachment points. If we have to do something similar again, we'll probably seek a different starting point. Rated 5 out of 5 by DeeZer In San Jose from An Almost Perfect Solution ... Thursday, May 14, 2009 7:46:52 AM PDT Hello! I had to make a very expensive investment in a high-end Manfrotto tripod before I realized my need for the Salon 230 Camera Stand from Manfrotto. If you do studio photography, and more particularly product and/or table-top photography, this product is an absolute must. Gone will be that third leg of the tripod that is always in the wrong position - either in your gut or the modeling table. Mind you, I have added a lot of 'accessories' to my Salon 230 Camera Stand. To counter-balance the added weight, I have added nine (9) counter weights at 4.4 pounds each to the balance weights in the column. My only 'complaint about the Manfrotto Salon 230 Camera Stand is that the stand is sometimes a bit difficult to roll across the concrete floor of my studio. Trying to get all three wheels pointed in the same direction can be somewhat of a chore; otherwise, I consider the investment to have been a wise one. Any idea how this compares to the Regalite Camera Stand? does the arm move in a 360 degree angle?